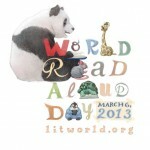 A bit late, but not too late, I discovered World Read-Aloud Day is this week, March 6. What a great idea. Check out their website for activities, including a lovely downloadable book perfect for reading outloud. Wonderful way to increase literacy. Sponsored by LitWorld, and their many partners, all of whom seem committed to literacy, it is a great reminder of how many people and organizations care about reading. I can’t wait to bring this to the children I’m reading with. I think when kids realize that others all around the world are also focusing on reading, it can give an extra boost to the reading spirit! For more info, check out the LitWorld website.